President Trump speaks while attending a briefing at Marine Corps Air Station Cherry Point in Havelock, N.C., on Wednesday, during a trip to visit areas impacted by Hurricane Florence. North Carolina Gov. Roy Cooper (left) and Homeland Security Secretary Kirstjen Nielsen (right) also attended the briefing. Residents look out at the flooded entrance to an apartment complex near the Cape Fear River in Fayetteville, N.C., earlier this week. "We're ready ... to do whatever we have to do to make this perfect," Trump said at Marine Corps Air Station Cherry Point in eastern North Carolina, where he received a briefing from state and local officials. "Nearly 20,000 federal and military personnel are supporting response efforts," he said. "More than 1.6 million meals have been delivered to North Carolina." Trump called Florence "one of the most powerful and devastating storms ever to hit our country" and promised federal support for disaster relief. "There will be nothing left undone," he said. "People don't realize how a very difficult phase is beginning today, with the beautiful sunshine," Trump said after his formal comments. "We'll have it all taken care of." 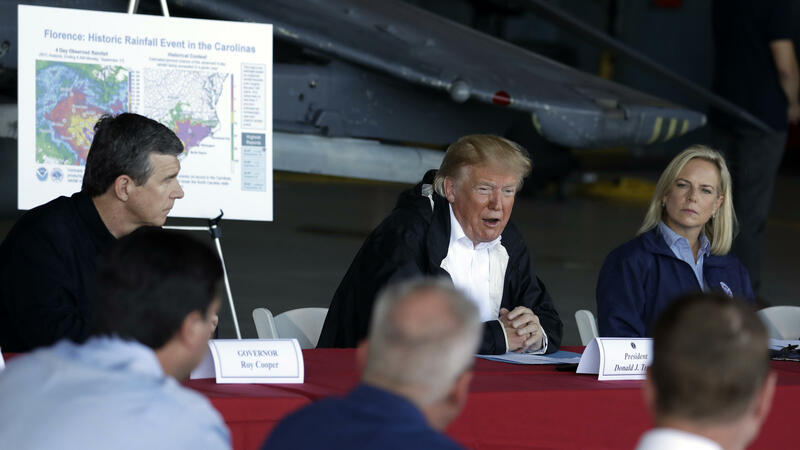 The military base is not far from New Bern, one of the communities hit hardest by Hurricane Florence and its aftermath, which Trump also visited. After landing in North Carolina and surveying damage, the president flew to South Carolina. "He wanted to see the areas hit the hardest and most impacted by the flooding, and get a full overview from both states," White House press secretary Sarah Sanders said before the trip. "Our state took a gut punch, Mr. President, and our people are still reeling," North Carolina Gov. Roy Cooper said at the North Carolina briefing. Cooper called the storm "epic," "disastrous" and "widespread," noting that 27 deaths have been confirmed by the state and others are under investigation. Also during the briefing, the president asked a state official, "How is Lake Norman doing?" After being told that the lake was fine, he replied, "I love that area. I can't tell you why, but I love that area." A lingering trail of debris from the floods littered the roads in New Bern, where Trump visited next. He met Jim Pennington, the pastor of Temple Church, a Baptist megachurch, which has been converted into an aid distribution center, and stood by his side as they opened up the food distribution line. Flanked by volunteers, Trump spent about 15 minutes handing out boxed food to a long line of cars where people drove up get hot meals. He frequently asked "how's the house?" as vehicles passed, and shook hands through car windows. Despite everything they had been through, the volunteers and locals were energized, cheering when he finished handing out food, then crowding around the president to get photos. Then, Trump walked through the neighborhoods of New Bern with the town's mayor, Dana Outlaw, and talked with local residents about the devastation to the area. It was dry outside, but the president was surrounded by obvious signs of water damage, such as piles of broken furniture and debris lining the sides of the road and boats that are shipwrecked a couple of hundred feet inland. Along some sections of the road, the turned-over couches, and chairs and heaps of scrap, stood roughly waist-high. Standing in front of a massive white boat that was dumped into someone's backyard, Trump turned to the crowd. "I think it's incredible, to see what we're seeing. This boat just came here and do you know whose boat that is?" he asked spectators. "They don't know whose boat that is, but it's not theirs. What's the law? Maybe it becomes theirs." Following New Bern, the president choppered an hour south to Conway, S.C., where he landed in the midafternoon. "We just left North Carolina; they got hit really, really hard ... all that water is coming your way," Trump told a crowd of roughly 100 local officials at the Horry County Emergency Operations Center. "Over the next couple of days it's going to get rough in South Carolina." South Carolina Gov. Henry McMaster spoke about the dangers of the water levels continuing to rise by several feet in his state. 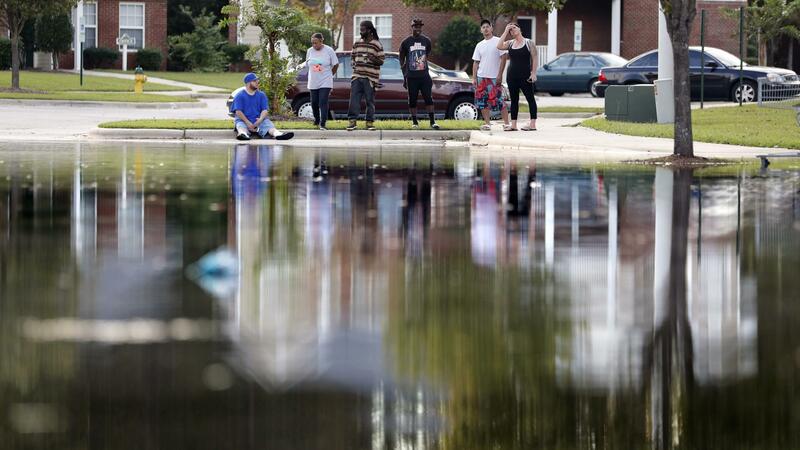 "This may be the worst disaster that we've had in South Carolina. ...We are confident that we are going to build our way out of this," McMaster said. "One great thing we have helping us is this man standing behind me, President Donald Trump." Facing risks ahead, McMaster praised the federal government's assistance to and cooperation with the state, saying it was better than ever before. Trump echoed the sentiment of unity. "Washington is with you; Trump is with you," the president said. "We are all with you 100 percent and we'll get through it." In a video released by the White House Tuesday night, Trump expressed condolences and thanked first responders for their efforts to save lives, while describing Florence as a particularly difficult storm. "This is a tough hurricane, one of the wettest we've ever seen from the standpoint of water," Trump said. "Rarely have we had an experience like it, and it certainly is not good." In New Bern, the reception to Trump's visit has been largely positive, according to NPR's Brian Mann. Several truck drivers who were bringing in water and other supplies told Mann they see Trump's visit as a sign that he is paying attention and that the recovery effort is on track, with some describing him as a "hands-on president." In Fayetteville, a city in central North Carolina where the Cape Fear River crested early Wednesday morning, hundreds of residents remain in shelters and county officials have confirmed at least two deaths. Adrienne Murphy, 38, has been staying with relatives on higher ground after being evacuated from her home near the river. She told NPR she hopes Trump will make sure that federal agencies respond quickly to help residents in crisis as the waters recede. Murphy said many in the community were displaced from their homes for months after Hurricane Matthew in 2016. Some struggled to afford food in the immediate aftermath of the storm, she said. Murphy said her message for Trump as he visits the state is, "Next week is a long time — you have to act now."